San Diego (AP) — Skullduggery and spying are alive and well in the America’s Cup, and so too apparently is a nasty feud between Emirates Team New Zealand and the regatta’s organizing authority. In a statement explaining changes to the rules governing the extremely technical daggerboards that help propel the new generation of wing-sailed, foiling catamarans, the America’s Cup Event Authority took the highly unusual step of informing the world that Team New Zealand damaged two of its daggerboards shortly after it began testing its new boat in Auckland last month. The statement gives the options for how the Kiwis can repair or replace the daggerboards while pointing out that teams can’t correct a design or construction flaw in repairing damaged daggerboards. Russell Coutts, a New Zealander who is both CEO of the event authority and of two-time defending America’s Cup champion Oracle Team USA, posted the statement on his Facebook page. Coutts has been at odds with Team New Zealand CEO Grant Dalton in recent years, and the Kiwis are believed to have won a case against ACEA before a secret arbitration panel that could result in a multimillion dollar award. The ACEA statement late Wednesday came a few days after Coutts used his Facebook page to respond to criticism in the New Zealand Herald about Oracle Team USA breaking with tradition and being allowed to compete in the challenger trials even though its spot in the America’s Cup match is guaranteed by virtue of being the defender. Coutts is a five-time America’s Cup winner. The first two were as skipper of Team New Zealand, the third as skipper of Alinghi of Switzerland and the last two as Oracle Team USA’s CEO, a non-sailing role. So how would ACEA know about the Kiwis’ damaged daggerboards? “We have been watched very closely by the Oracle SoftBank spies every minute we have been on the water and their vigilance makes me think we built a very good racing machine,” Dalton said in a story on Team New Zealand’s website about the Kiwis wrapping up training in home waters before shipping the boat to Bermuda for the trials, which start in late May. SoftBank is a Japanese team that is receiving technical assistance from Oracle Team USA. Spying in the America’s Cup is an age-old tradition. Not so traditional is the event authority publicly commenting on information gained via spying and then offering repair advice. Teams are only permitted to build two pairs of daggerboards for their 50-foot catamarans. Most teams have elected to build one pair geared toward performing well in heavier winds and one pair for lighter conditions. When the cats hit a certain speed, their hulls rise out of the water on the daggerboards — or foils — which reduces drag and increases speed. Late last year, a majority of teams voted to amend the protocol to allow up to two identical spare boards to be built, although they can only be used if the race boards are damaged unintentionally. The change was made after some teams damaged daggerboards after hitting objects in the water while training in Bermuda. Team New Zealand was the only team to oppose the change. Of course, reconnaissance works both ways. Team New Zealand COO Kevin Shoebridge said the Kiwis have been keeping an eye on rivals in Bermuda. 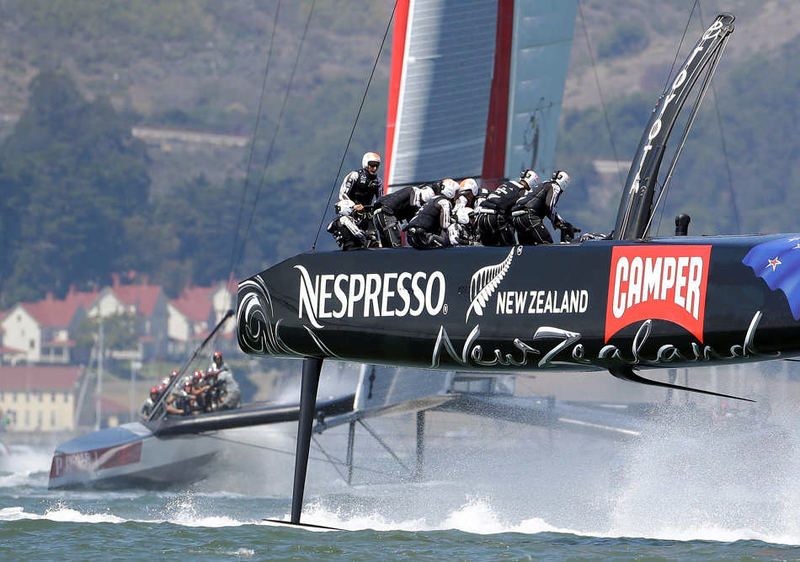 Team New Zealand was the hard-luck loser of the 2013 America’s Cup on San Francisco Bay, blowing an 8-1 lead to Oracle Team USA, which won eight straight races to retain the oldest trophy in international sports.